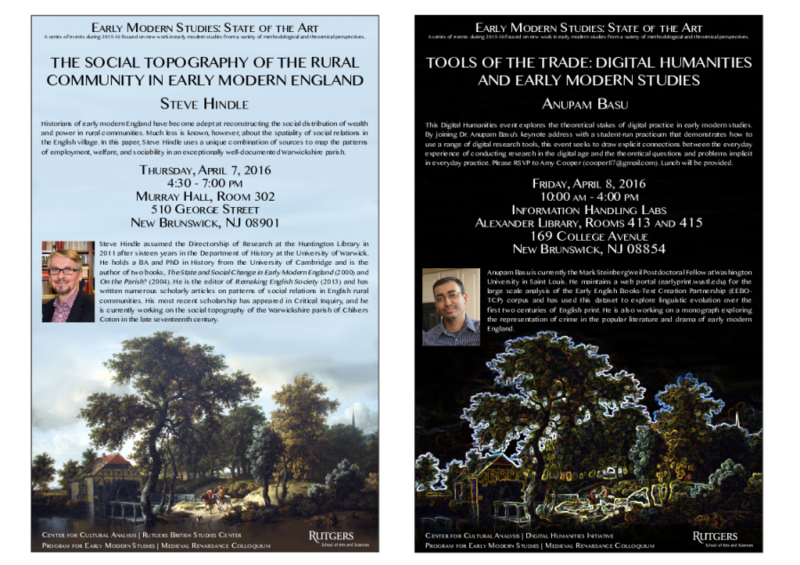 Please join the CCA, PEMS, and the Medieval-Renaissance Colloquium at their upcoming Symposium, Tools of the Trade: Digital Humanities and Early Modern Studies, Friday April 8th. This Digital Humanities event explores the theoretical stakes of digital practice in early modern studies. By joining Dr. Anupam Basu’s keynote address with a student-run practicum that demonstrates how to use a range of digital research tools, including WordHoard, Evernote, and the folder-file system that comes standard with most operating systems, this event seeks to draw explicit connections between the everyday experience of conducting research in the digital age and the theoretical questions and problems implicit in everyday practice. To what extent do research and writing tools shape how we think and write about literature? Does the word “tool” adequately capture the scope of what digital humanities has to offer? Or does the term “digital humanities” describe a methodological shift in literature studies, on the order of New Criticism or New Historicism? Please join the Center for Cultural Analysis, the Program in Early Modern Studies, and the English Department’s graduate student-run Medieval-Renaissance Colloquium as we explore these questions. Lunch will be held at the Rutgers Club and anyone interested in attending should send their RSVP to Amy Cooper (coopera87 AT gmail DOT com) by Tuesday, March 29th to reserve a seat. Event details below. Included below are several sample abstracts of graduate presentations that demonstrate the range of ideas and types of questions the practicum will address. WordHoard, an application built on a database of deeply tagged texts, enables both close and distant reading as well as a variety of large-scale comparative analyses of works by Shakespeare, Spenser, Chaucer, and Early Greek Epic writers. Its tendency to prioritize the word encourages thinking about the word as a particular unit of meaning that transcends particular texts and contexts to move in different ways across categories as diverse as gender, genre, and time. WordHoard’s underlying structure of morphological and structural tags allows users to fracture and reorganize texts and corpora in new ways, but its orderliness and standardization exists in tension with the semantic and grammatical fluidity that characterizes texts written in a pre-standardized English. Its interface makes analysis available to anyone, but its underlying programming language requires a reimagining of texts not just as strings of words, but also as differently assembled collections of spaces or locations inhabited by those words. Evernote is a note-taking app that organizes and archives a range of media, including text, voice-memos, images, and web-pages into digital “notebooks.” By allowing users to navigate their collection through hyperlinks, Evernote makes possible associative rather than static, linear, hierarchical structures of organization. This move from linear to associative organization exemplifies a larger trend in apps designed to facilitate the organization of ideas through the metonymic organization of words and images: keyword searches, links, and sorting functions externalize cognitive processes once restricted, in the pre-modern era, to the trained memory. Where “memory” was once a metaphor for processes and operations performed by computers, the computer has, in a perverse reversal, become a metaphor for organic memory. By taking mnemonic metaphors in our own digital discourses seriously, I suggest that our own “artificial memories” return us to a model of memory that is “inventive” in the rhetorical sense. I hope to draw suggestive comparisons between our own digital memories and the artificial memories of pre-modern poets such as Chaucer, Spenser, and Jonson. Storing computer files in a folder system is its own kind of organizational technology. Further, it is a technology that relies on acceptance of an ancient metaphor: that the branching structure of a tree is a self-evident way to organize knowledge. Trees have been used as schematics for systems of knowledge for thousands of years, but the practice exploded in popularity in the twelfth century and again in the early modern period. In this presentation, I will discuss the benefits and limitations introduced by the tree model of information storage, retrieval, and display, and overview techniques such as metadata and shortcuts that minimize the disadvantages of storing documents in nested folders. Please contact Amy Cooper with any questions.